The quantity, variance, and quality of our lines allow us to meet the needs and performance requirements of any project whether commercial, institutional, industrial, or residential in nature. 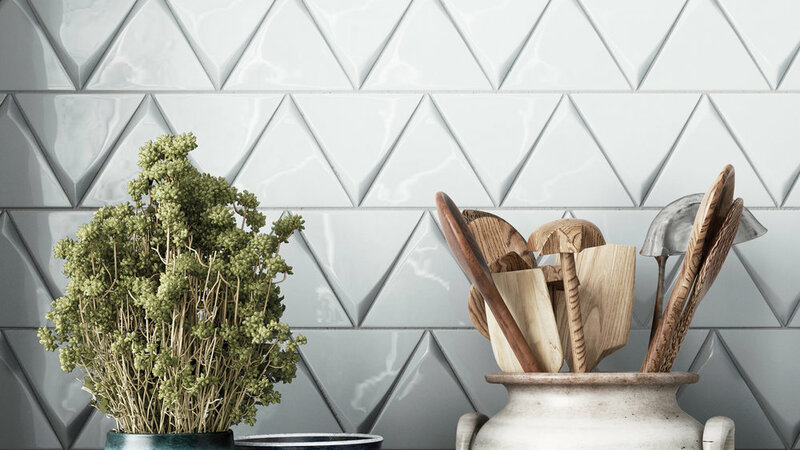 When properly installed and maintained, tile solutions can be enjoyed for many years. Quartz surfaces are the ultimate combination of nature and technology. 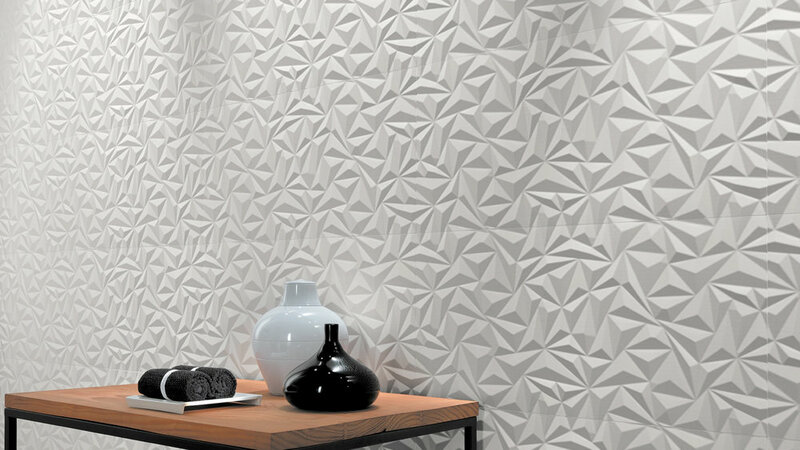 Non-porous, scratch resistant and highly resistant to stains, the surface retains its beauty without sealants or waxes and is almost maintenance-free. Ideal for any interior space, quartz surfaces have four times the flexural strength and double the impact resistance of granite while impressively outperforming marble. Quartz counter tops are globally recognized for their simplified fabrication and installation processes that enable cost-effective solutions. Due to the material’s outstanding durability, it can be installed in thinner forms to save weight, or in larger sections to reduce the amount of joints on a surface. This enables even further money-saving features that customers happily applaud. The mixture is then poured into a mold and formed into slab sizes of 306x144 cm or 120x57 inches. The slab is then compacted by a special vacuum and vibration process at a pressure of 100 tons. Slabs are then gauged, calibrated and polished to a perfect finish in a wide range of colors and designs in one of two textural surface finishes: Polished or Honed. Finally, the slabs pass through quality inspection to ensure every customer receives a top quality product. The integral solidity and strength of quartz surfaces provide designers with the widest possible choice of profile options available in natural stone products. This freedom inspires architects and designers to explore creative concepts and shape them into practical applications. The slab dimensions of quartz surfaces are 56½" X 120" which enables optimized flexibility and maximum utilization of material. Slabs are available in two thicknesses - 2 cm and 3 cm in order to enable a multitude of applications. Whether for private quarters, work areas or public spaces, quartz surfaces represent a solid asset that ensures value for money and return on investment for years to come. Porcelain slabs are naturally resistant to high temperatures, will not burn in the event of fire, and will not suffer thermal damage when a hot coffeepot or pan is placed on the surface. They can also be used outdoors, as sunlight does not alter any of their features. Scratch resistance is superior to other products. Where wood and laminates suffer continual damage from scratching, porcelain’s tough surface can withstand daily wear and tear. No coloured resins or protective paints, such as those applied to other materials, are used to add colour or gloss. Perhaps best of all it requires no special maintenance or attention. Porcelain products can all be cleaned with ordinary soap and hot water or common cleaning products. They are resistant to chemicals and acids of all kinds, including lemon and vinegar. Porcelain slabs are made using natural clays and mineral colours which are pressed and fired to make a high-performing surface. The product can be recycled after use, which only confirms its low environmental impact. We offer professional counter top installation in Agoura, Calabasas, Camarillo, Malibu, Moorpark, Newbury Park, Oak Park, Oxnard, Simi Valley, Thousand Oaks, Ventura, Westlake and surrounding areas. Our expert craftsmen will take the time to do your job right the first time and we will stand behind our installation. Natural stone has a long history of use in construction, providing people with beautiful and durable building materials. The natural stones used extensively in construction today include marble, limestone, travertine, granite, and slate. While all have the natural beauty and allure of nature, each type of stone has advantages and disadvantages which determine its best use. The use of marble and travertine for flooring dates back thousands of years. The original city of Rome, Italy, was built from marble and travertine that was quarried in blocks in the hills and rolled down to the city on logs to be cut into building blocks and tiles. If you go to Rome today you will see buildings, walls, floors, sidewalks, and curbs made from marble and travertine that have stood the test of thousands of years of wear. Across the world today people still love the beauty and durability that natural stone provides. Today the use of travertine tiles is the fastest growing segment of the flooring industry. In the past, polished granite and marble graced the floors of the wealthy, but the use of polished stone has decreased in recent years because homeowners are increasingly looking for the less formal look of travertine for their homes. Travertine is also more affordable than the marbles and granites, which has added to its popularity. Like granite and marble, travertine is available in both slabs and tiles. Travertine slabs are mainly used for countertops in bathrooms. The main uses for travertine tiles include flooring, shower enclosures, and backsplashes for kitchen and bath cabinets. Marble is a timeless material that has been in use for thousands of years. We stock a large selection of White Carrara in all tile sizes in addition to mosaics in both polished and honed. Smooth but unpolished travertine is called “honed.” Honed travertine is set with a very small grout line in a rectangular or diamond pattern. Many people prefer this contemporary look, particularly when a more formal look is desired for the home. Travertine can be polished but only the densest travertines look good when polished. Honed travertines are available in the sizes of 12" x 12" and 18" x 18". Sometimes travertine is available in 16" x 16" and 24" x 24" but the selection in this size is extremely limited. The most common size used for floor applications is 18" x 18" which can be laid diagonally for a more elegant look. Tumbled travertine is manufactured by putting the tiles into a water, sand, and gravel mix and then vibrated or tumbled. This process abrades the face and edges of the stone making it look like it has been in use for thousands of years. Tumbled travertine is available in smaller sizes, like 4” x 4”, 6” x 6”, and 3” x 6”, which are usually used for backsplashes and shower walls. Smaller sizes are generally available on a 12” X 12” mesh and include: 5/8” x 5/8”, 1” x 1”, and 2” x 2”. Tumbled travertines are also available in 12” x 12” and 18” x 18”. Rarely it’s possible to find 16” x 16”, 24” x 24”, and 4-piece Versailles pattern. The most popular look in travertine today is the 4-Piece Versailles pattern which is composed of pieces of four sizes: 8" x 8", 8" x 16", 16" x 16", and 16" x 24". These are assembled into a pleasing pattern which is ideal to achieve a less formal look to a home. Many of the Versailles pattern floors are wire-brushed to accomplish an ancient look like tumbled stone. Generally wire-brushed stone is also given a chiseled edge to complete the ancient look. Quartzite is a hard, non-foliated metamorphic rock which was originally pure quartz sandstone. Sandstone is converted into quartzite through heating and pressure usually related to tectonic compression within orogenic belts. Pure quartzite is usually white to grey, though quartzites often occur in various shades of pink and red due to varying amounts of iron oxide. Other colors, such as yellow, green, blue and orange, are due to other minerals. Most colors are available in 12" x 12", 16" x 16", and 24" x 24". A few colors are available in a 4-Piece Versailles Pattern. Slate is a stone that is often used outside because of its rougher, more natural texture. It is also used inside to give a more natural feel to a room. 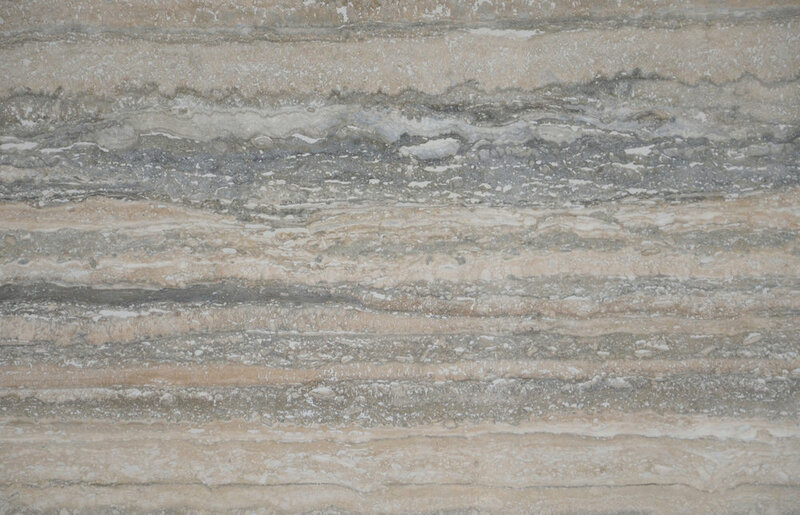 In general, it has higher variations and darker colors than travertine. Most colors are available in 12" x 12", 16" x 16", and 24" x 24". A few colors are available in a 4-Piece Versailles Pattern. Limestone has been quarried and used to construct everything from biblical royal palaces and temples to humble residences. Our selection includes a variety of different finishes such as polished, honed, tumbled, brushed and chiseled. With its extreme density and beautiful range of rustic colors, limestone has solidified its place in the market. Granite is the hardest of the stones which makes it perfect for applications which undergo heavy use. The most popular place you’ll see granite in the home is on kitchen countertops. Polished granite slabs have the beauty to enhance the look of any kitchen and the durability remain beautiful through many years of wear. Granite is also used extensively for floors and walls in high-traffic commercial buildings. Granite is sometimes used for flooring in homes, but its use has declined in recent years as styles have shifted toward unpolished flooring with more neutral earth-tone colors.